This book tells the tale of the brilliant aerodynamicist Beverley Shenstone MASc, HonFRAes, FAIAA, AFIAS, FCASI, HonOSTIV. As R.J. Mitchell s chief aerodynamicist, it was Shenstone who designed the Spitfire s wing the wing that gave the Spitfire it crucial advantage in the Battle of Britain and beyond. A quiet man, Shenstone never sought glory for his work, yet in recent years he has been credited as the man who persuaded Mitchell to adopt the ellipse a modified ellipse that was unique in its shape and its combined use of two integrated aerofoil sections. Shenstone s knife-edge shape reached far back into early aeronautics for its inspiration. 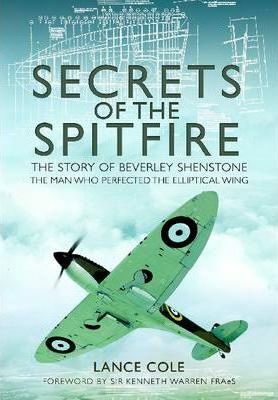 This book also names the other forgotten Spitfire design contributors who were Mitchell s men Mr Faddy, Mr Fear, Mr Fenner, Mr Shirvall, a Prof Howland and others.Intriguingly, Shenstone had left his native Canada and early training as an RCAF pilot, to study at Junkers and then under the father of the delta wing Alexander Lippisch in Germany in the early 1930s. There, he became immersed in delta wings and flying wings. He also became a glider pilot. The story of how Beverley came to be in the right place at the right time is revealed for the first time. So too are the enigmatic tales of his involvement with the military, the intelligence world, Lord Beaverbrook, the USAF, and Canadian aviation.During the war Shenstone worked at the top secret Wright Patterson air force base and was involved with the Air Ministry and the pro-British movement in America when Shenstone worked for Air Chief Marshal Sir Wilfrid Freeman, the unsung hero behind British defence procurement. Shenstone achieved high office a President of the Royal Aeronautical Society, technical director at BOAC, chief engineer at BEA and a consultant to several aircraft makers. He was courted by Avro, de Havilland and Vickers, and was the force behind the renaissance of human-powered flight.Using exclusive access to his family documents, his unpublished autobiography and many notes and stories, as well as forensic research, this book details for the first time, a new twist to the Spitfire s story and the secrets of its advanced science. A tale of design and military intelligence reveals a story of a man whose name should be more widely known in the UK, Canada and the aviation world."